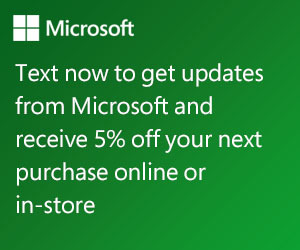 Just text MSPFS text to 30364 to get an Exclusive Code to save 5% at the Microsoft Store! Looking for deals from the Microsoft Store? Sign up to get the latest news, events and offers delivered to your phone via text. For signing up, you’ll receive 5% off your next in-store or online purchase! Be sure to reply and opt in once you receive the text. Click here to sign up today!